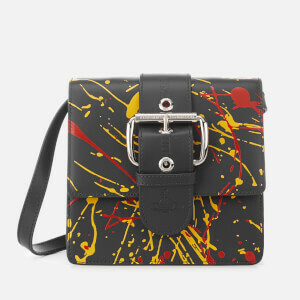 Women's colourblock bag from Diane von Furstenberg. Combining striped raffia with sleek, nappa leather to form a textured design, the 'Bonne Soirée' bag features an orange, black and yellow-striped front flap that opens with a magdot fastening to reveal a concealed slip pocket and a lined, main internal with zipped pocket and two card slots. Designed to be worn three ways: wear crossbody with the choice of two straps (gold-tone chain or orange webbing), or as a grab bag with the rolled leather top handle. The versatile piece is finished with black piping throughout and two additional slip pockets to the rear external. Foil branding to the back. Straps are not removable.